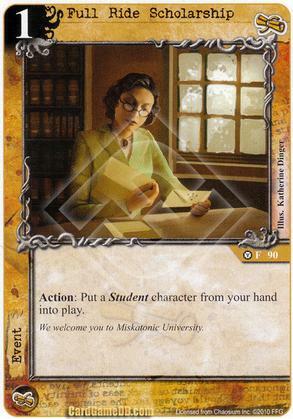 Flavor Text: We welcome you to Miskatonic University. Nice to cheat Brette Wulffsen into play without worrying about her Loyal otherwise doesn't seem so great. Yeah, Brette's the stand-out candidate for this, but there are some other 3-cost Students I wouldn't mind dropping on turn 1, like Eryn Cochwyn or maybe even the new guy, Walter Gilman. Fairly recently I used this in addition to 'Night Class' to sneak characters into play. With most students you don't save much, but the surprise factor makes up for it. It also works for Syndicate's 'Jacob Finnegan' if you don't have a domain with the right faction resource available. The other advantage of using this card to bring in students...is to keep domains open for other uses. I have been looking at this card for an MU deck I have been toying with.... right now it is making the cut.